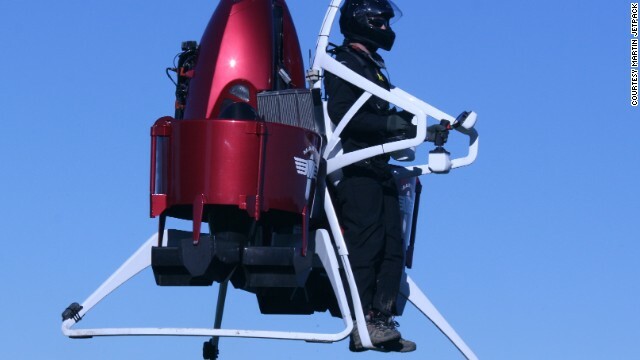 Introducing the "Martin Jetpack," the brainchild of New Zealand inventor Glenn Martin. Martin worked on the design in his garage for over 30 years, with wife Vanessa becoming his first test pilot. The futuristic flying machine can travel at 74 kilometers per hour, soar 900 meters into the air, and last 30 minutes before refueling. 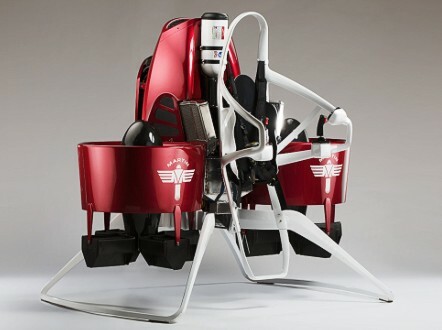 The company is now looking for $4 million in funding to help get the jetpack onto the market. If successful, it would be the first flying machine of its kind to be commercially sold. Martin (pictured right) shows off an earlier model. The 54-year-old dreamed of flying to school in a jetpack when he was five-years-old. Could his dream become reality? (CNN) -- Inventor Glenn Martin admits he appears crazy -- "But it's the crazy people who change the world." "Some people work on old cars, some do quilting, some collect stamps, I build jetpacks." Night after night for 30 years, the New Zealand father-of-two worked on a secret machine in his garage. Wife Vanessa was one of the few people who knew about the space-age contraption quietly taking shape at their home in Christchurch. Luckily for Martin she was not only "as crazy as him," but petite enough to be its first test pilot. Twelve prototypes and $17 million later, and what started as a young university student's hobby could soon be on the market, the first flying machine of its kind ever to be commercially sold. "I wanted to fly to school as a five-year-old," said the 54-year-old inventor, who previously worked in marketing in the pharmaceutical industry. "I saw 'Lost in Space,' 'Thunderbirds,' and the Apollo program when I was young. When Neil Armstrong stepped onto the moon, I knew that anything was possible. Somehow we lost that spirit." Everyone that is, except Martin. With a wingspan of just over 2 meters, his futuristic flying machine can travel 74 kilometers per hour and soar 900 meters into the sky. Powered by a V4 200-horsepower engine, it zooms through the air on two giant ducted fans, with enough fuel to last 30 minutes. 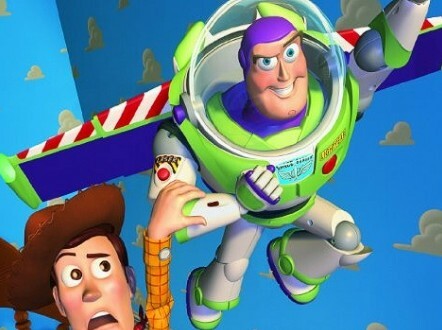 Should the pilot let go of the controls, the jetpack will automatically hover on the spot. An inbuilt parachute can also be launched in an emergency. It might seem like an unlikely design for a man with a degree in biochemistry and physiology. But as Martin says, building things is just part of the "Kiwi" way -- referring to the nickname for people from New Zealand. "Kiwis live outdoor lifestyles and by the time I was 20 I could ski, mountain climb, abseil, ice skate, kayak, surf, hang glide and skydive," he explained. "We have a tradition of making what we need, of inventing things. So Jetpacks are a normal extension for the people who created the jetboat and bungee jump." Martin is now on the search for investors to help get his jetpack, ahem, off the ground. The company needs $4 million in funding. Should it succeed, the machine could be available just months later, with a price tag of around $150,000. But just what will this daring design be used for? "Our first product will be targeted at First Responders -- fire brigades, the police, ambulance services, along with search and rescue, disaster recovery, and border control," said the company's chief executive, Peter Coker. 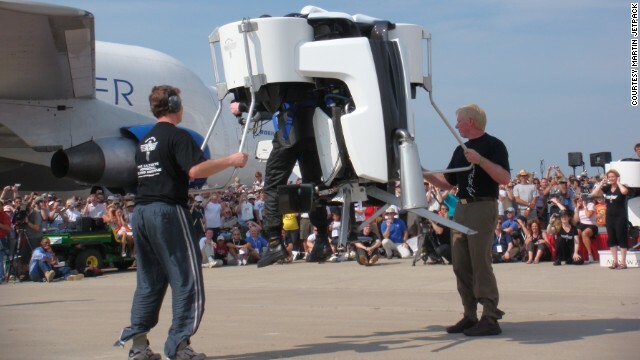 "There will also be an unmanned version capable of lifting 100kg in weight. We've already had interest from many other places, including mining and agricultural companies." There are also plans to release the jetpack to the tourism industry and ultimately to individuals -- though its use will come down to aviation laws in each country. New pilots would also be required to undertake a week-long training course. 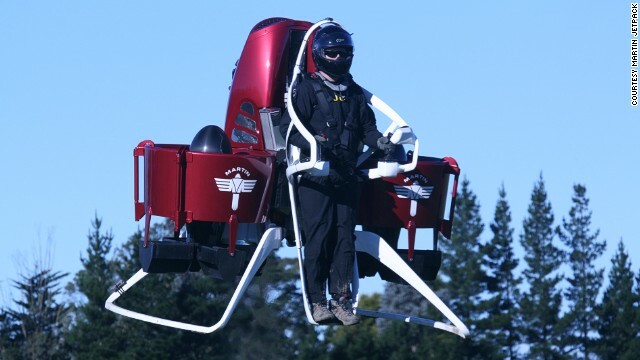 Could we really see people flying jetpacks around our cities in the future? 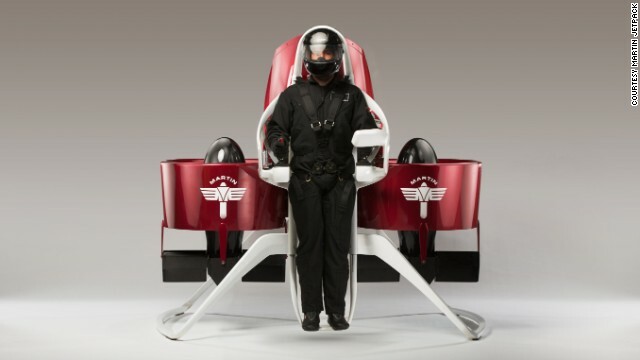 "The jetpack is well-suited to operate in cities," said Coker. 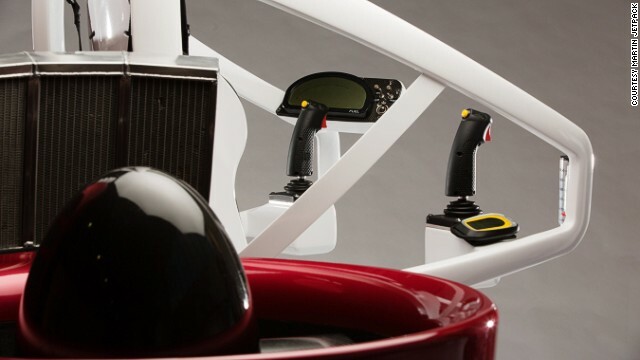 "Without the large rotor blades similar to a helicopter, it can operate in confined spaces." Could personal jetpacks soon become reality? "There is less opportunity at present for personal jetpacks to fly around urban environments, due to regulations. But I think this will probably change over time as new approaches of highways in the sky for personal transport are developed." For Martin, it would be a little boy's dream come true. "I was three-years-old when Al Shepard went into space, four-years-old when John Glenn completed an orbit, nine-years-old when Apollo 11 went to the moon, and 21-years-old when I decided to make a jetpack," he says. At 54, he could be about to fly into the history books himself. Watch: Can this drone get you home?